Most of our customers ask how often the air ducts in their home of office should be cleaned. Our recommendation is typically every 2 to 3 years. Headaches, itchy eyes, dry skin are other signs that the air that is being circulated through your air ducts is contaminated with any number of harmful substances. More frequent cleaning is suggested for those with allergies or asthma, smokers and pet owners. If you are purchasing an existing home or a new home, we highly recommend having the air ducts cleaned before you move in. Your air ducts are ideal breeding grounds for fungus, molds, spores and bacteria. They couldn't ask for a darker, damper place to grow! Whenever your heater or air conditioner is on, these contaminants are blown into your home along with dirt and dust. This results in unhealthy indoor air quality. Removing contaminants from the air duct system is one of the best ways to control dust, reduce indoor air pollution in your home or work environment, and promote long equipment life. We use powerful vacuum, and sanitation solutions to remove allergens. For older homes, this may never have been done. With new construction, debris collects in the vents during the building process. 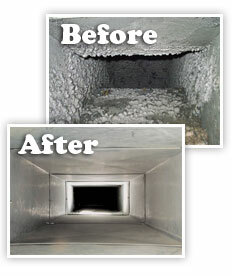 Another consideration is to have your air ducts cleaned after renovation or remodeling. If you know the number of registers and returns in your home, we can provide a quote over the phone...and remember, there are never any hidden charges. We'll count the number of openings when we arrive at your home, and if we find a difference in the number of openings, there may be a small adjustment to the price.